Fans of planet Earth probably recognize the Matterhorn in the foreground of this night skyscape. Famed in mountaineering history, the 4,478 meter Alpine mountain stands next to the totally eclipsed Moon. In spite of -22 degree C temperatures, the inspired scene was captured on the morning of January 21 from the mountains near Zermatt, Switzerland. Different exposures record the dim red light reflected by the Moon fully immersed in Earth's shadow. Seen directly above the famous Alpine peak, but about 600 light-years away, are the stars of the Praesepe or Beehive star cluster also known as Messier 44. 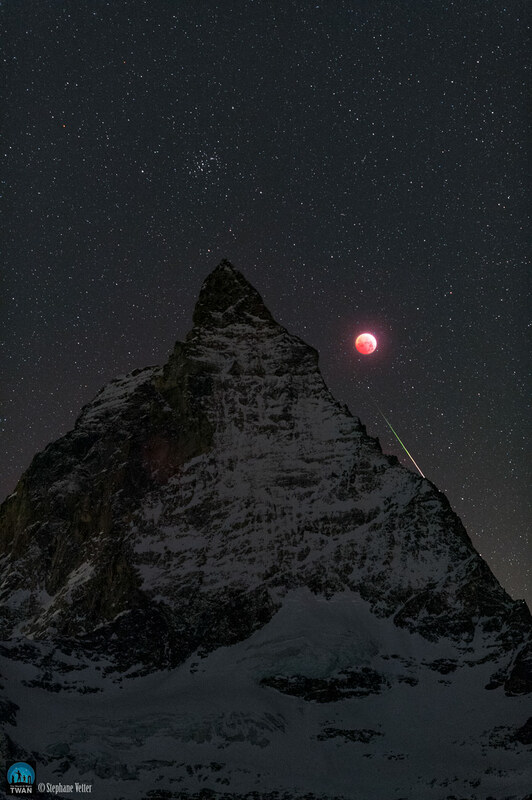 An added reward to the cold eclipse vigil, a bright and colorful meteor flashed below the temporarily dimmmed Moon, just tracing the Matterhorn's north-eastern climbing route along Hornli ridge.